What's an authentic ancient Egyptian temple doing 2,000 miles outside of Egypt? The temple in question here is Madrid's Temple of Debod, and for more than 40 years it's served as one of the most unique, offbeat and pleasantly surprising sights in the Spanish capital. As one of just four Egyptian temples located outside of Egypt, laying eyes on this incredible example of ancient architecture is a once-in-a-lifetime opportunity. Still not convinced you should include the temple on your Madrid itinerary? Considering that it's completely free, there's no excuse not to go. Here's how to make the most of your time at Madrid's Temple of Debod. 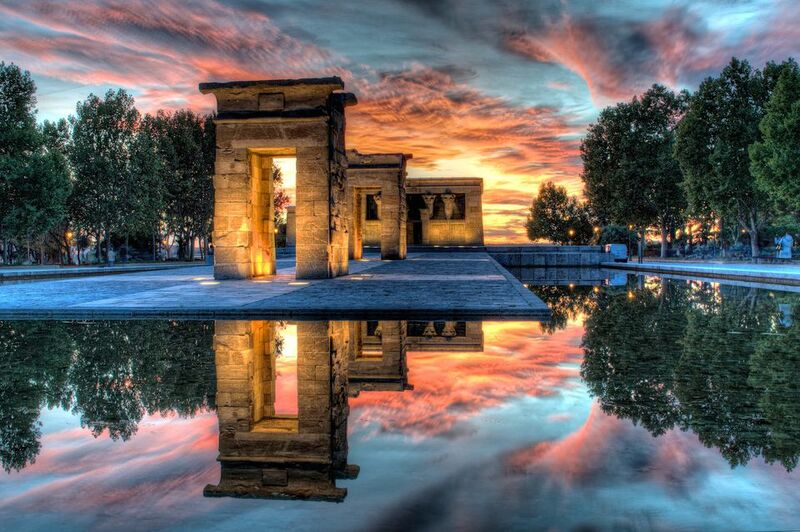 As you might imagine, the Temple of Debod's original home was actually not Madrid. The structure is an authentic temple built in ancient Egypt to honor the god Amun and the goddess Isis. Its original location was about 9 miles south of the city of Aswan close to the Nile River. Construction of the temple started in the second century B.C. under the orders of Meroë King Adijalamani and continued throughout the next few centuries. The full temple as we see it today wasn't completed until Egypt's Roman period. As a result, it packs the influence of multiple iconic civilizations into one structure. The temple's Madrid story doesn't begin until the 1960s, when the construction of the Aswan High Dam posed a threat to this magnificent historical treasure. Rather than leave it in place and risk irreparable damage, the Egyptian government offered the temple as a gift to Spain as thanks for helping restore other ancient temples in the area. In 1968, the Temple of Debod was completely deconstructed, moved to Madrid, and rebuilt in Madrid's Parque del Oeste. The temple now proudly draws hundreds of thousands of visitors every year from all over the world. As one of the world's few examples of Egyptian architecture located outside Egypt, its unique history makes it a standout among Madrid's many other fascinating sights. The inside of the temple contains a hall, several chapels, a small museum and more. Unfortunately, at the time of this writing it is currently closed to visitors. However, you can still enjoy the temple's marvelous splendor from the outside. Make your way along the sacred processional walkway through the arches and let yourself be transported back in time to the glory days of ancient Egypt. The monument's centuries of magic and history will take your breath away. The temple is gorgeous at any time of day, but for an especially stunning view, be sure to come at sunset. Great care was taken during the reconstruction process to maintain the temple's original east-to-west orientation, and as a result, the monument enjoys a breathtaking, colorful backdrop as the sun fades away below the horizon. The Temple of Debod's location in Parque del Oeste makes it easily accessible from Madrid's compact city center. It's an easy walk from other iconic sights such as the Royal Palace and Plaza de España (more on those in a bit), and well-served by public transportation as well. Just take Metro line 3 to the Plaza de España or Ventura station, or line 10 to the Plaza de España station, and it's a quick walk from there. Just across the street from the temple, you'll find one of Madrid's most famous and emblematic squares: Plaza de España. Crowned by a monument to Cervantes and flanked by some of the city's tallest skyscrapers, the lovely square seamlessly blends nature and history with the thriving modernity of contemporary Madrid. Make your way south and you'll stumble upon the Royal Palace, the official residence of Spain's royal family. While the king and queen of Spain don't actually call this stately, grandiose building home (they live at a different palace on the outskirts of Madrid), it's still used ceremonially and packs centuries of luxurious history into 1,450,000 square feet. If you'd like to get away from the tourist crowds and relax a bit, some of Madrid's best green spaces are easily within reach from the temple as well. The Sabatini Gardens and Campo del Moro Park are both lovely options for a relaxing stroll to help you escape the hustle and bustle of the city.